One fleeting glance, we think we know a dog. We gage their personality based on looks alone. And, if a dog on the street has the same physical attributes as a dog we have lived with or knew at any stage of our life; we automatically assign the same temperament because he or she is also fluffy, short, muscly, floppy-eared, has a mustache or boasts a smile. But, dogs are much more complex creatures and deserve the space and time to be appreciated for their unique awesomeness, quirks and all. We are starting this series in hopes that by seeing the FACES OF wonderful dogs and reading their beautiful stories that we better understand a dog’s color, shape and size are not indicative of how friendly, cuddly, nervous or even, aggressive a pooch can be. Our goal is to reduce aesthetic stereotypes that prevent amazing dogs from being adopted. But, we also hope to decrease biting incidents because dogs who need space are not bombarded just because a human thinks he or she is cute. We will kick off this series with a little diddy about Gavin, the FACE OF Bark Pouch and our Director’s sidekick and volunteer extraordinaire. Gavin’s previous person was arrested and the remaining family members did not want him or his brother so they tied them up outside. During that time, Gavin was shot with a BB gun. Both dogs were taken to Animal Care and Control where they were assessed, loved and even attended a manners class and play groups with Safe Humane Chicago. 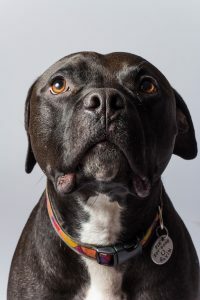 It did not take long for Gavin to use his best shimmy-wiggle-pittie-scrunch-face to win the heart of ALIVE Rescue who cared for him until they brought him to my condo for a meet and greet. I opened my front door and Gavin immediately ran away into the other room. I crouched down. Gavin’s eyes lit up. He trotted to me and flopped his too-skinny (no one yet knew of all his food allergies), snotty-nose (from kennel cough) self into my lap. We both knew. Gavin is black and pretty ripped for a dog who believes there is no need to go outside between the hours of 4pm and 7am. Twice, I was told by random people on the street that Gavin was vicious because he is a pit bull. Without even interacting with Gavin, a man walking past us asked me if my dog was a pit bull. I said “I think so, I have never had his DNA tested”. The man proceeded to tell me that his friend had a pit bull as he gripped his wife’s arm and that I should get rid of my dog because he was going to kill someone. I asked the man, “can you tell me where you received your master’s degree in canine behavior?” The man walked away shaking his head, at me. During a second incident, a little boy ran up to Gavin and asked if he could pet my dog. I said yes, he is very friendly. A man seemingly with the child rolled up to us in his wheelchair then immediately squealed “OH MY GOD, THAT’S A PIT BULL” and sped away; leaving the child and I standing there, dumbfounded. Gavin is the BIGGEST BABY. After a fire engine passed by Gavin too closely one afternoon when he was outside with his dog walker; our leash walks went from fun and relaxing to terrifying and stressful. I sometimes had to carry Gavin a couple blocks because he was so nervous that he could not move. People driving by seemed to think it was funny, neighbors watering their lawn made snide remarks about how spoiled my dog is. If I had the chance to interact, most folks apologized when I told them Gavin was scared and I refuse to drag my dog down the street. Fear and anxiety. Of course, daily training and behavior modification are key to his recovery and continual improvement. But, Gavin is the snuggliest dog I have ever met . And, I truly believe that if I withheld affection like some popular approaches tell us to do; Gavin would not be as silly, goofy and playful as he is today. PET ME, LOVE ME. Gavin absolutely thrives on human attention. If every person who passed him on the street rubbed his shoulders and smooched him (yes, Gavin likes being hugged and kissed), he would forget about barking dogs and fire trucks. What you see on the street is not always indicative of who a dog is or what he or she has overcome with their person. Photo of Gavin taken by Christy Gregory.